Weeks spent at summer camp as a kid fueled a love of bonfires and fire pits. 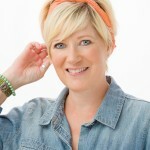 As I grew into adulthood, I became a camp counselor and camp director, all the while looking forward to sitting around the campfire with the people around me. 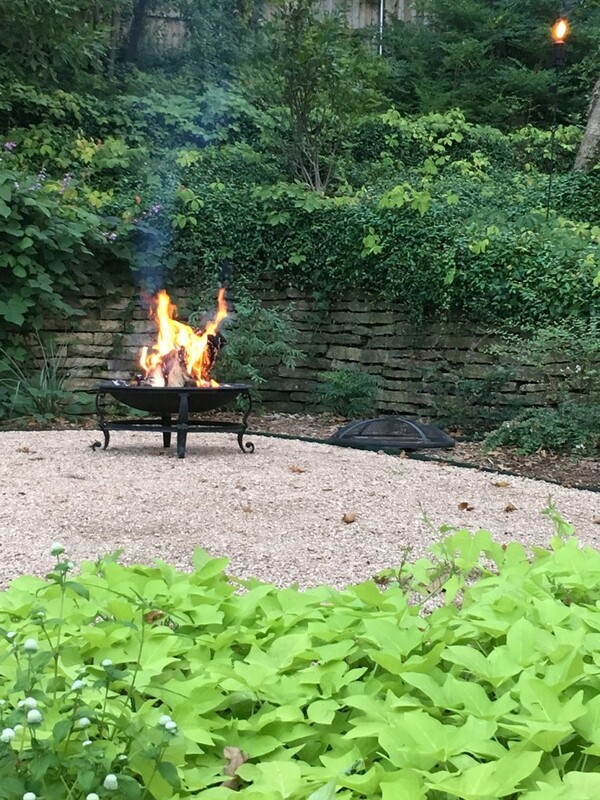 Outdoor fires (in both warm and cold weather) have a way of drawing people together, encouraging great conversations, laughter, and story-telling — any garden of mine will always have a fire pit area for exactly this type of gathering. 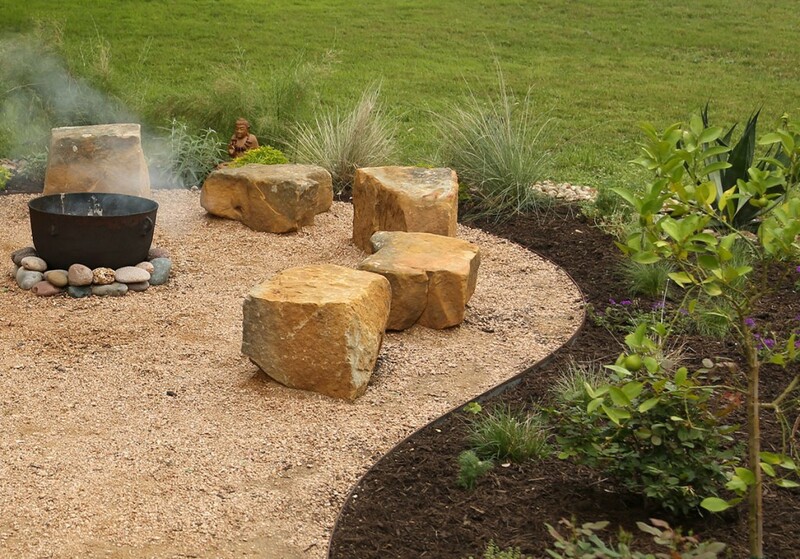 Are you thinking about adding a fire pit area to your backyard? Here are my top recommendations for creating a safe and fun experience for you and your family! Permanent or Movable? Fire pits can be permanent fixtures in your yard, or they can be movable structures, and which one you choose depends upon your budget and aesthetic. Permanent features tend to be more expensive because they are likely mortared into place. While they can be a fun DIY project for the experienced homeowner, you might want to consider hiring a professional. 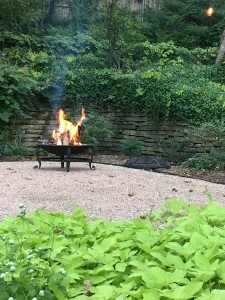 Movable fire pits, on the other hand, can be as simple as an iron cauldron, like mine, giving you the flexibility to change your gathering space on a whim. Look at outdoor furniture stores or home improvement stores for movable fire pits — they are typically very reasonably priced. Materials Permanent fire pits can be made of mortared cobbles or sawn blocks, or of non-mortared concrete blocks from your local home improvement store. These types of stores often have instructions on how to use their products to create your own fire pit, and I’ve found them to be fairly inexpensive and of good quality. Movable fire pits can be made of steel, copper, or other metals — there is sure to be one that fits your budget and the look you are going for! Placement Fire pit placement is important for practical as well as aesthetic reasons. Aesthetically, you’ll want your fire pit to be either in a spot of your yard that is a focal point, or tucked into a corner where your gathering is more cozy and intimate. For safety purposes, plan to have your fire pit a minimum of 10’ away from a neighboring structure or house, and preferably away from overhanging tree limbs. Seating should be a minimum of 3’ away from the fire pit to avoid uncomfortably hot knees. Gardens are a beautiful way to surround and soften a fire pit area, but be sure that flowers, leaves, and branches are well out of the way.